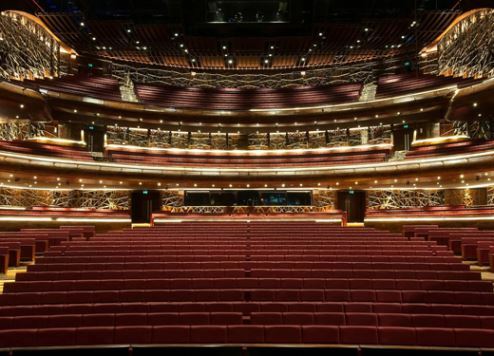 Dubai Opera, one of the newest icons in entertainment-focused Downtown Dubai, is set to bring another world-renowned show to its stage. The modern and architecturally-striking performance venue, which most recently staged Mary Poppins to the delight of young show-goers and their families, will play host to the Andrew Lloyd Webber and Tim Rice musical Evita in early 2018. Following its successful run in London’s West End, the show will come to Dubai for 16 performances, from January 22 to February 3, 2018. With lyrics by Tim Rice and music by Andrew Lloyd Webber, the legendary show tells the famous story of Eva Peron, First Lady to Argentine president Juan Peron, who dedicated her life to charity and was heralded as the ‘spiritual leader of the nation’. Released as a rock opera in 1976, the Tony award-winning show has enjoyed more than 40 years of success in London’s West End and on Broadway. Evita combines the best of musical performance with award-winning songs that are famous the world over including 'Don’t Cry for Me Argentina', 'On This Night of a Thousand Stars', ‘You Must Love Me’, and ‘Another Suitcase in Another Hall'. Liz Koops, CEO at Broadway Entertainment Group, said: “Following on from the phenomenally successful season of Andrew Lloyd Webber’s CATS at Dubai Opera, Broadway Entertainment Group is delighted to be presenting with Dubai Opera this renowned musical classic. Evita is sure to delight and wow audiences." Jasper Hope, chief executive at Dubai Opera added: "I am delighted that we will welcome this sensational production of Evita to Dubai Opera with its scintillating score incorporating classic Latin Tangos and Paso Dobles. Love her or hate her, there's no doubting the impact of this incredible woman's story on Argentina and the world."